IA Transforms an Unused Manufacturing Facility for a Global IT Leader. HPE Erskine. 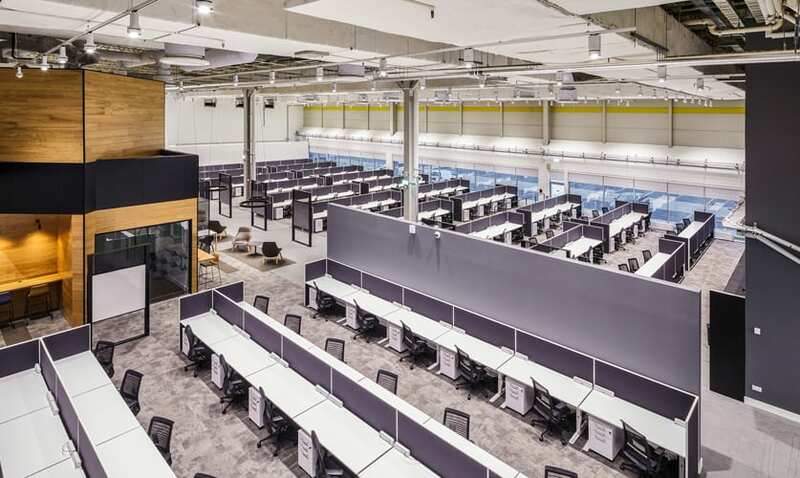 Photo © SG Photography Ltd.
At the Hewlett Packard Enterprise (HPE) campus in Erskine, Scotland, IA converted a 25-year-old manufacturing facility into a compelling workplace for hundreds of new staff. 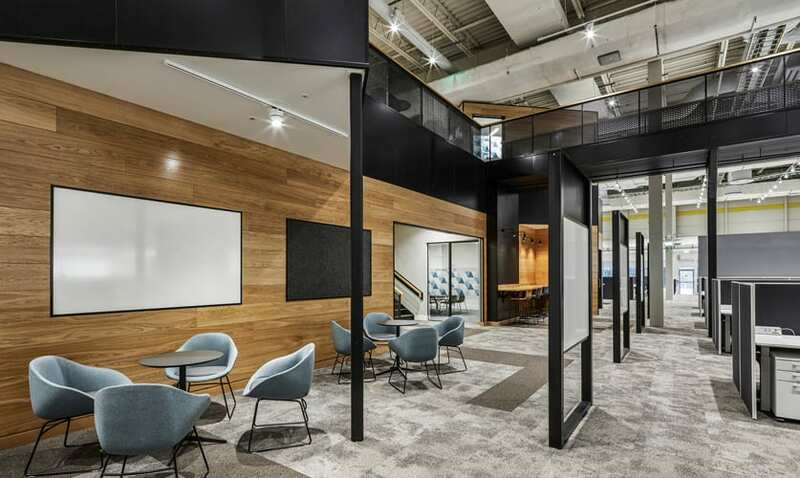 The design represents a new way of working for HPE: open, flexible, and focused on movement, with multiple opportunities to increase staff interaction—a major project goal. 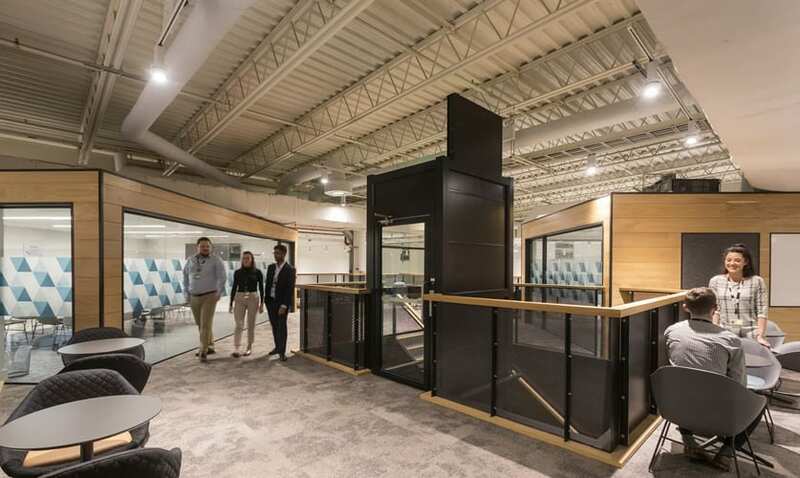 The iconic focal point and defining hub of the massive 28,700-sq-ft, two-story structure is the centrally located core, anchored by a stair and elevator, which serves to organize the open office plan and provides a visual diversion from the vast expanse of workstations. The hub is a refuge from desk-based activity and offers a variety of settings that accommodate any type of work and provides interest and movement; staff can easily be seen climbing the stairs or riding the elevator to the second story with its impressive views of the entire office below. A mezzanine, original to the structure, is connected to the second story by a bridge. 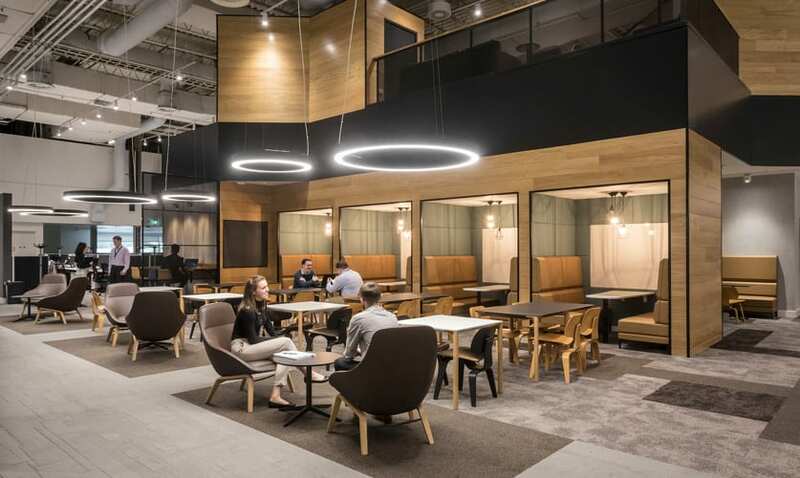 The majority of finishes and accents throughout the facility are neutral to timelessly link the building’s past to its new, commercial interior. The doors and docks of original loading bays have been replaced with floor to ceiling glass matched to existing windows for more natural light. Suspended from the 30-foot-high open ceiling, LED spotlights generate a quality of light that underlines the sense of volume. Workstations are organized into a series of teams, each centered on an isle along the circulation route and marked by a vertical freestanding screen, writable and magnetic on one side, acoustic and tackable on the other. 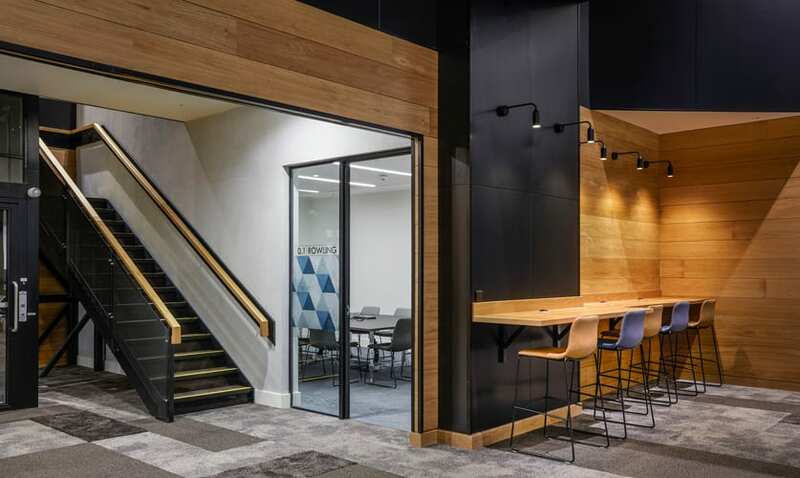 Placed throughout the design, these bespoke screens encourage impromptu meetings and interaction away from desks. Warm wood finishes and soft surfaces mark shared areas. Semi-private booths for casual use offer comfort and a more intimate setting in contrast to the building’s scale. Meeting rooms of varying size are surrounded by comfortable chairs and working-height tables, along with tall counters and stools. Conference rooms can be found on every floor. Several expanses of specialty wall finishes in shared areas evoke energy through patterned geometry and/or bright colors. Custom designed graphics on the glass walls of meeting rooms incorporate a familiar HPE branding stripe that seems transparent but obscures vision for privacy. 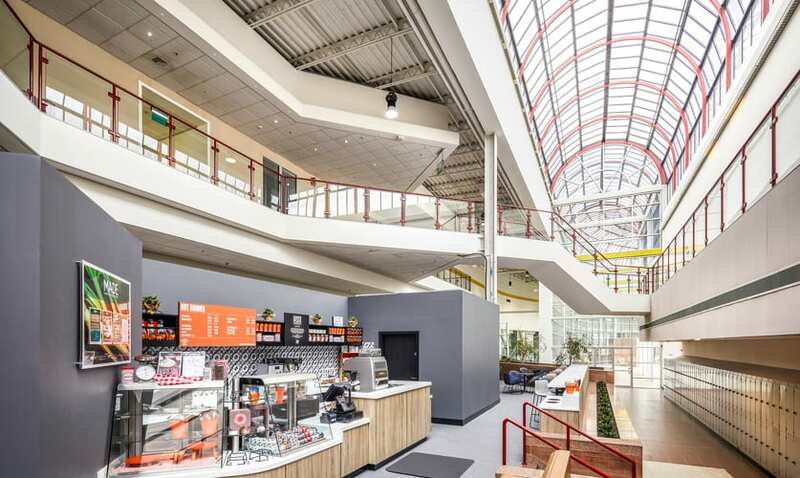 In addition, to serve the large staff, IA designed a café with lounge seating in a portion of the building’s atrium. There were a lot of challenges but I knew I had the right team in place. The approach was all about problem solving. Global Real Estate Project Manager, Hewlett Packard Enterprise Ltd. If you enjoyed this project file on HPE, you'll probably enjoy reading the project file on BlueCat Networks. Click below to view the project file. Another stunning, bold project from IA!